Today I picked my habanero peppers I have been growing on the deck. I love to plant these little peppers in amongst my coleus plants. They are stubborn little devils. At 200,000 to 300,000 Scoville units each, a measure of their capsicum, or hotness, these really are devilishly hot! These peppers are among the hottest peppers on the planet. Handling them requires gloves unless you like pain. Eating them is almost out of the question. Last year I diced the peppers and put them in the freezer. I labeled them POISON. Then I used about four diced flakes in a large pot of chili. Those four little flakes heated up that whole pot! 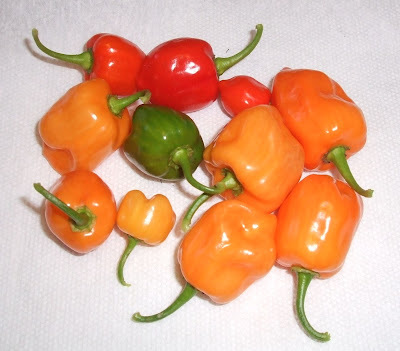 This year I will also put my gloves on, dice these pretty peppers into pieces and use them in many pots of chili. I don't really know what else to do with them. I could make them into hot sauce, but it is probably too hot for anyone to enjoy. They may not be that practical, but boy, are they pretty! I had a lot of fun watching these peppers grow in their pots all summer, and you can't put a price on that!